There are a number of films and cartoons that have been made in the past decade that deal with the theme of food. I suppose it’s only natural that they have become firm favourites in our house. “Cloudy With A Chance Of Meatballs”, or simple “Meatballs” in our house, is a feature length animation that has captivated the family time and again. I love the transformation that food undergoes in the cooking process; where a few simple ingredients become a nourishing meal. I’m not sure that I could transform my dishes into a global weather event but this meal is a family favourite. I understand it’s probably not going to be a life changing dish for you, but we all need comfort, a nourishing meal to return to again and again when life is in ebb and flow. This is something that’s not too taxing to make, that my kids will definitely eat, that will satisfy you. You know it’s perfectly okay to serve up the same meal more than once a fortnight? Or even (gasp) more than once a week? Sometimes I can put too much pressure on myself, to innovate in the kitchen, to challenge my tastebuds, to get more fruit and vegetables in the kids’ diet. The gas thing is, my kids have never sat at the table and said “I want to eat something different today”. That’s something that I should bear in mind more often. This recipe is basic, you can add or remove your own spices and seasoning as you cook. Put the minced beef into a large bowl, sprinkle with the water, salt & pepper. Rinse your hands well under water and while still wet use your hands to mix everything together before wetting your hands again (I keep a bowl of water nearby) shape the balls. We like large golf-ball sizes and it’s 2 or 3 per adult and 1 or 2 per child. Preheat your oven to 180 degrees Celcius and put the meat balls into an oven proof dish. Bake in the oven for about 30 minutes before adding them to sauce. Here I’ve used some of my hidden vegetable sauce as I’ve a glut of fresh tomatoes at the moment, and serving with cooked pasta of your choice. Obviously we use spaghetti for this recipe! Peel your carrots and onions, trim the celery at either end. Chop the root vegetables roughly OR put all root vegetables into a blender and blend until they are a fine texture. I would highly recommend blending them first as it saves you lots of time. In a large pot heat 2 tablespoons of olive oil on a medium heat and saute the vegetables for 2 mins to warm them through. Add 2 tablespoons of tomato puree to the pot and stir so that it coats the vegetables. Chop the tomatoes roughly and add to the pot then cover with 500ml of water. Add a very small pinch of sugar to counteract the acidity of the sauce. You don’t need much as carrots have natural sugars so it’s not to sweeten the flavour of the sauce. I now add a half teaspoon each of salt & pepper but if you’re on a low sodium diet then you can omit the salt. Stir well and bring to a simmer. Cover and leave simmering for 90 mins, remembering to keep on stirring every 20 mins or so. If you’re using chunky cut vegetables test them with a fork to make sure that they are cooked through before turning off the heat. If not, cook for longer until they are.Blend this sauce with a stick blender while hot or wait until it has cooled and blend using a jug blender. If you have neither, get busy with a vegetable masher! If you’re looking for other food along the film theme, don’t forget to check out my Spaghetti Meatballs Cake which is great fun and easy to make. Finally, I’ve a lovely competition this week to win some food related goodies. It’s incredibly simple to enter so get your name in the pot. Thanks Corrina, it is a big family favourite! I love that movie, and I love the idea of serving a themed dinner with it! This looks fab, I might try it with equal parts pork and beef mince this weekend. A great idea Aurora, I love the mixture of mince it makes for a lovely flavour. 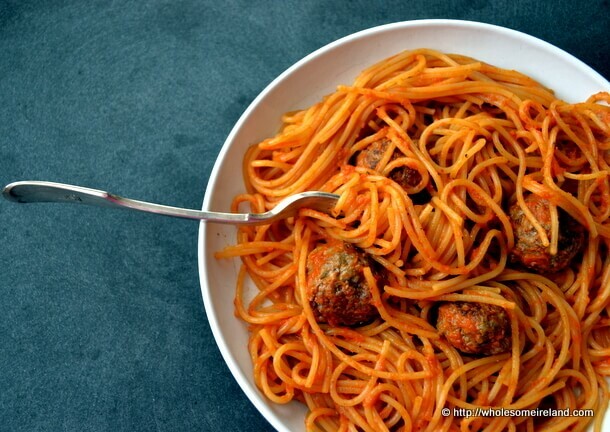 I really like having my meatballs and tomato sauce with rice instead of spaghetti. And we were just talking about that film yesterday! Meatballs & rice is yummy, just perfect. Sure whatever works is good! I think we watched it for the eleventy seventh time last weekend! I wish I’d thought of making meatballs for that movie, it was on TV the other night and it was our first time seeing it, the children loved it. Will be better prepared with your recipe for the next viewing! Good idea Joanna! I think that having themed food at a movie night is a great idea. I love meatballs with this movie & ratatouille with the movie of the same name!